messaging news and reviews for Windows Mobile Pocket PC, Palm, Microsoft Smartphones and Symbian cell phones. 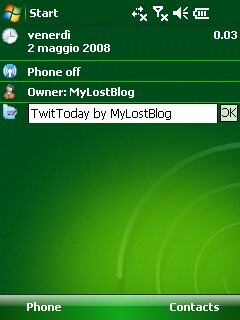 TwitToday is a simple today screen plug-in which allows you to post twitter messages directly from your's Windows Mobile device home screen. The application is just 20kb and it will not lag your Pocket PC at all. It is not so sophisticated like the previous Twitter applications like Twobile I've talked about earlier, but it works like a charm. To find more information about it and download it go to Freeware Pocket PC site and send me impressions. If you are not familiar with Twitter you can read my explanation and follow us there.